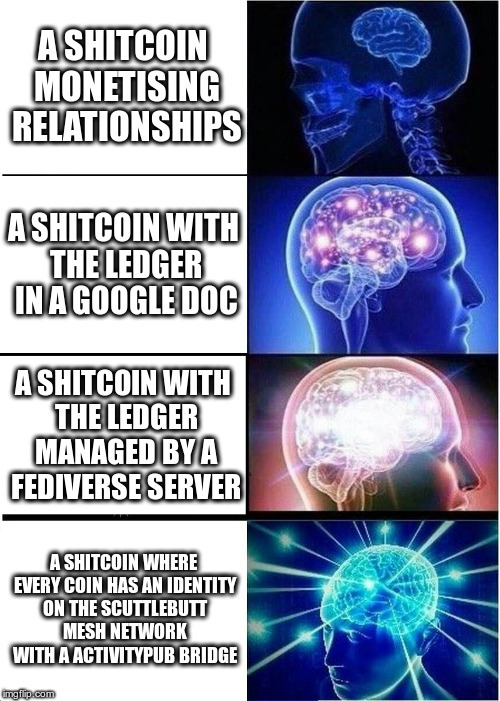 Introducing Blessings – a new kind of #shitcoin. Coins are minted when I [henceforth: the issuer] ‘bless’ a person [henceforth: the owner]. This is worth one coin, which belongs to the person who receives the blessing – the owner. This blessing takes place via a post to social media which @s the account who receives the blessing. An entry for this is entered into the ledger. Coins can be sold and traded, also via social media, by making a post announcing that this has occurred. This must @ the new owner and also the entity acting as the banker, who will update the #ledger. Coins may also be redeemed – in this process, they are returned to the issuer in exchange for short musical compositions. Owners of coins may occasionally be asked for favours by the issuer, but, as is usual with favours, have a right to refuse. There will be a staged rollout of gradually upgrading the ledger backend. Every coin will have a unique ID, the owner’s social media account, and the URL of the post in which the change of ownership occurred. Each coin will maintain a history of owners and transactions. Coins are atomic units and can not be split. Version 2.0 will automate banker activities – each coin and the banker will have an #activitypub account on a server dedicated to the currency. Each coin will post a status as it’s ownership changes and be able to respond to queries about it’s current status. In version 3.0, each coin will have a #scuttlebutt ledger and thus their record of existence will be maintainable over mesh, and they won’t require a server or network. However, there will be a bridge to activitypub to mirror all ownership changes to the #fediverse. Q: How does someone get blessings? A: People who wish for blessings may ask for them. They may also be minted in response to especially good shitposting or acts of friendship. Q: How are they redeemed for musical compositions? A: Owners wishing to redeem their blessings should contact the issuer to discuss what sort of music they would like. Q: Will there be support for additional social media platforms? A: By design, coins can only be minted on platforms used by the issuer. Q: Will there be a Diaspora* mirror for when the coins get their own social media presence? A: The issuer will happily deploy a Diaspora* mirror if one gets written, but has no current plans to develop one. Q: What if an owner moves to a new social media account? A: This would be handled just as if it were a trade between two people on separate accounts. Q: What if an owner’s server goes offline and they cannot make a post about the coin’s new ownership? A: The owner must contact the banker or issuer with evidence that they are the same person. Q: Are the coins susceptible to hacking or impersonation? A: Just like every other digital currency, there are many vectors in which coins can be permanently lost or stolen. Q: What is the crypto aspect of this currency? A: Blessings are digital currency shitcoins, but will not be #crypto until version 3.0. Q: Blessings rely on a single authority to facilitate trades. What happens if the issuer dies or leaves social media? A: All relationships end eventually and when they do, their value lives on in memory. The value of blessings will also be in their record and memory, but will no longer generate new records or memories.